My family just returned from a 6-day spring break trip to Manhattan, indulging in all the expected tourist activities including Broadway shows with a once-in-a-lifetime backstage tour of Phantom, 5th Avenue shopping, and a gut-wrenching visit to Ground Zero. But as a family of foodies, eating was always a priority. My 16-year old son is an accomplished eater and photographer so here is a recap of our eating adventures through his hungry, artistic eye. After a self-guided walking tour of mid- and uptown Manhattan, we headed back to our hotel and took a chance just picking a restaurant on 53rd St. – an area not necessarily famous for great eating establishments. But there were more choices in one short block than within 5 miles of where we live in South San Jose. 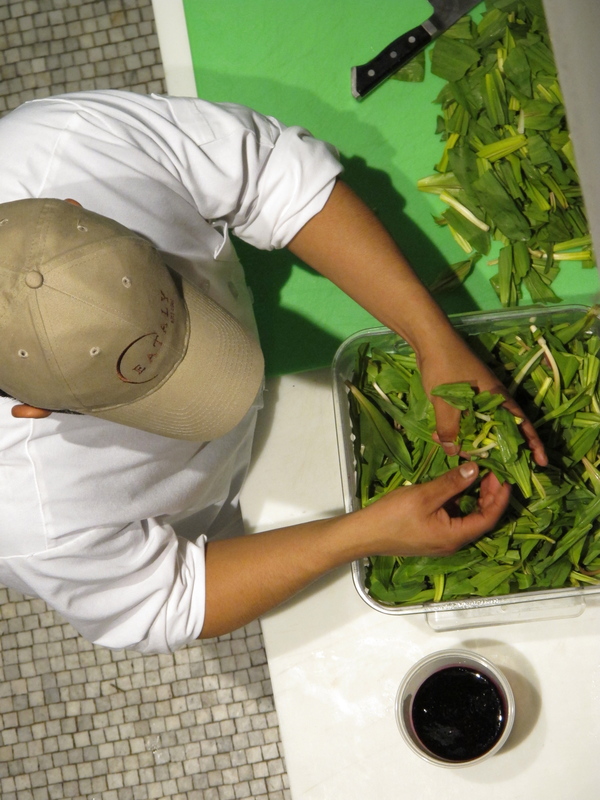 We chose a tiny hole-in-the-wall with 4 tables called Radicchio. Dormant Chef and I had to run around the corner to the wine store for a bottle of red — they served no alcohol but also had no corkage if you brought a bottle. Nice. I ordered the arrabiatta risotto – a spicy tomato rendition. 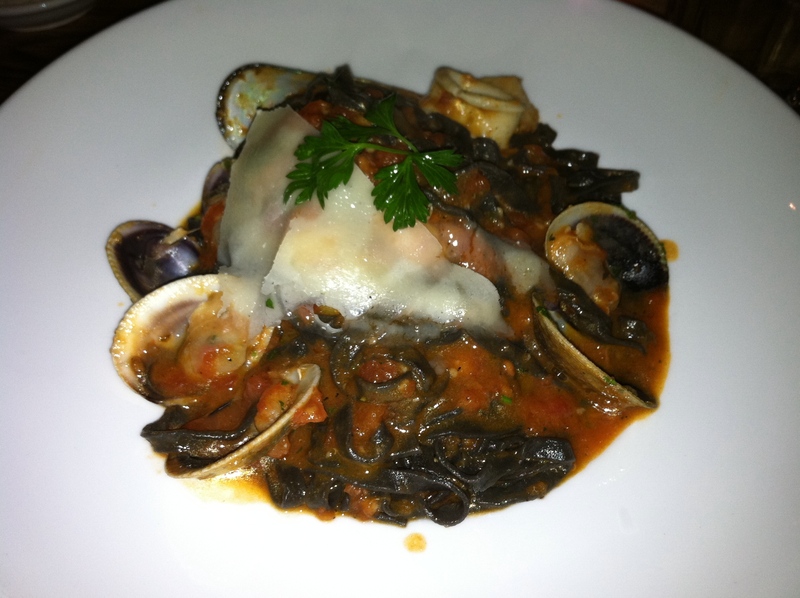 My daughter tried the bolognese, Hungry Teen the squid ink pasta with seafood and Dormant Chef the tartufo. Each dish was unique, perfectly flavored and the pasta or risotto cooked just al dente. Rivaled the best pasta we ate in Italy. Right on 53rd St. Considering not returning to San Jose at this point. After seeing a tweet from Giada De Laurentis about a perfect Cafe Americano at Le Pain Quotidien – a bakery specializing in organic breads and pastries served around a communal table, I found a location near our hotel and we headed there Friday morning. 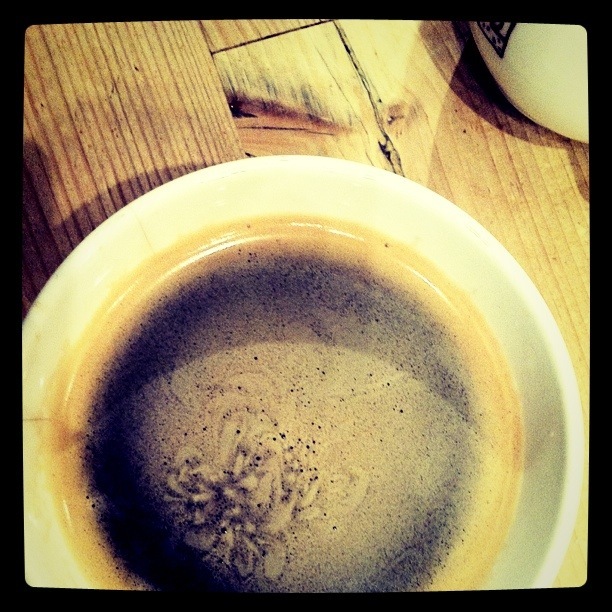 The coffee and pastries did not disappoint. After visiting the Tenement Museum, we strolled around the streets of the Lower East Side with Grandma on the phone telling us where to go, as her family lived there in her early childhood. 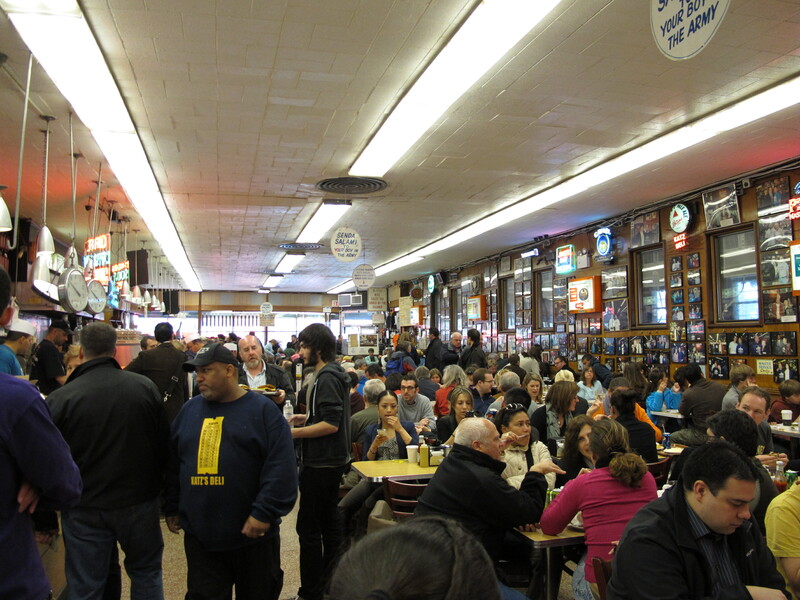 We then pretended to be hungry again and headed to Katz’s Deli for their famous pastrami (and yes, the fabulous Meg Ryan/Billy Crystal When Harry Met Sally scene as well). 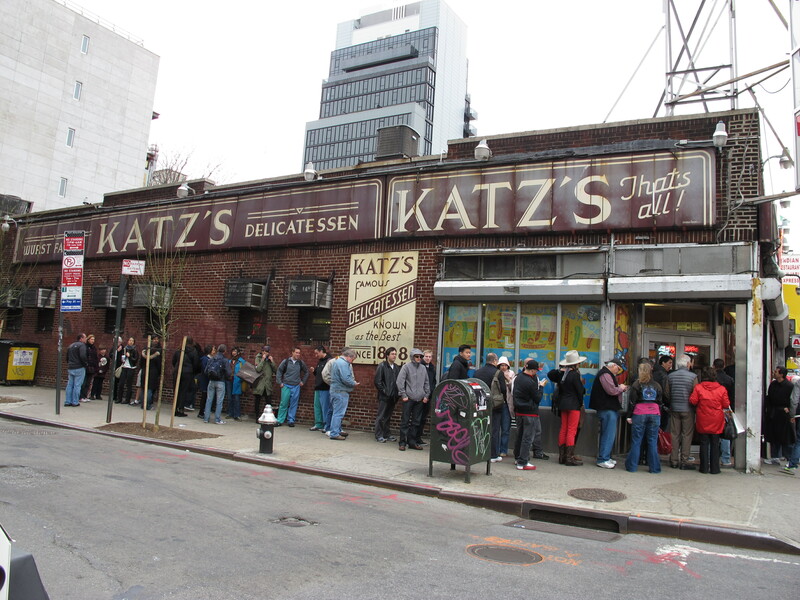 The line was long but quick and the crazy atmosphere inside was worth it – the best pastrami I’ve ever had and I grew up eating pastrami in Brooklyn delis, which are pretty darn good. After a morning of culture at the Guggenheim Museum on the Upper East Side near Central Park, we headed to the Flatiron district to explore the new mega Italian dining and shopping complex called Eataly. It was packed with people ranging from tourists to locals with baby strollers and shopping carts. 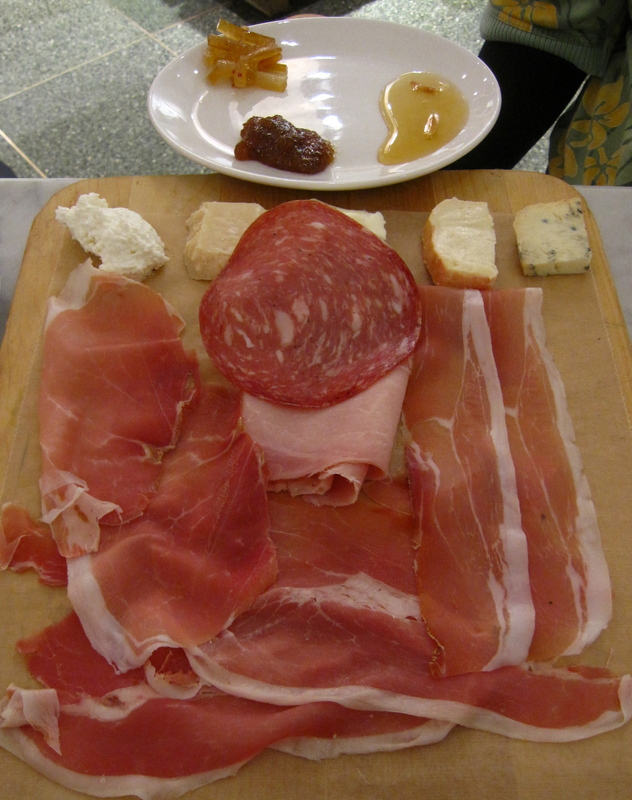 Not daunted by the crowd – we explored for a bit, put our names down for the Pizza and Pasta restaurant and then found a bar table near the mozzarella-making station and ordered a platter of house-made salumi and cheeses served with fig jam, honey, and citrus marmalade. We enjoyed every bite, especially exploring the 5 cheeses with the different spreads. The pizza and pasta paled in comparison to the unique, rustic, and complex flavors we enjoyed on the salumi and cheese platter. Ramps were the featured seasonal vegetable as you can see in the photo to the left. We did order and enjoy the “ramped-up” margherita pizza that was one of the restaurant specials. After strolling all the way up Fifth Avenue from the Flatiron district and exercising our shopping muscles along the way, we walked back to our hotel, stopping at a restaurant called The Fig and Olive. No information and expectations low – we really just wanted some soup, salad, or light appetizer. 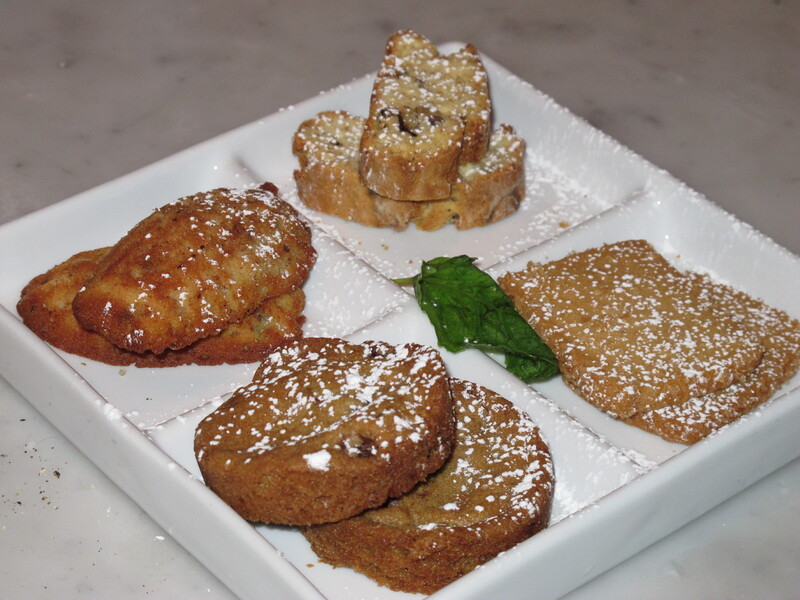 Which is what we had but with the addition of olive oil tasting from Greece, Australia, and California, outstanding Mediterranean cuisine, and this most surprising cookie sampler for dessert with lavender madeleines, fig chocolate chip cookies, pistachio biscotti, and lemon shortbread. 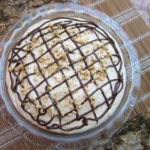 More calories than we needed but the flavor combinations were oh so worth it. 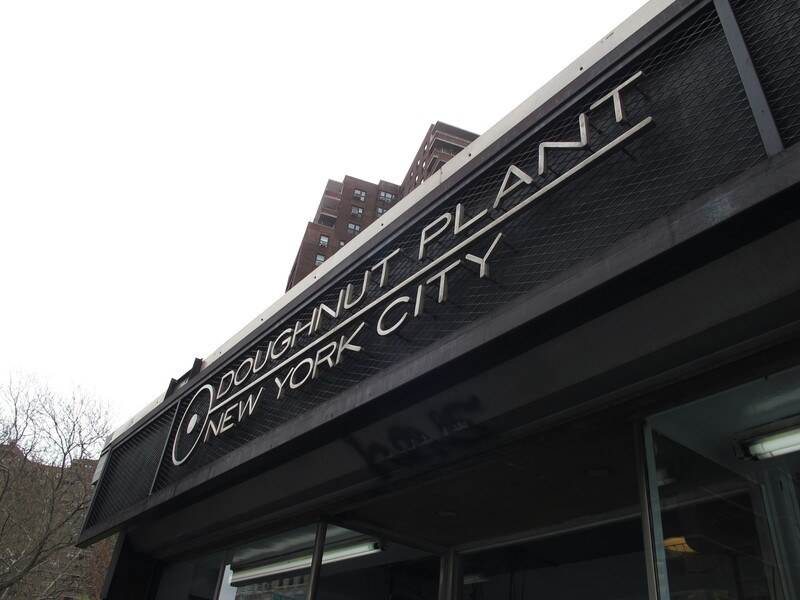 We started the day heading down to the Chelsea Market – home of The Food Network and many wonderful food and eating establishments. We stopped at Sarabeth’s Bakery at my request, since I’ve gotten to know her through Twitter and just had to try her baked goods. They did not disappoint. 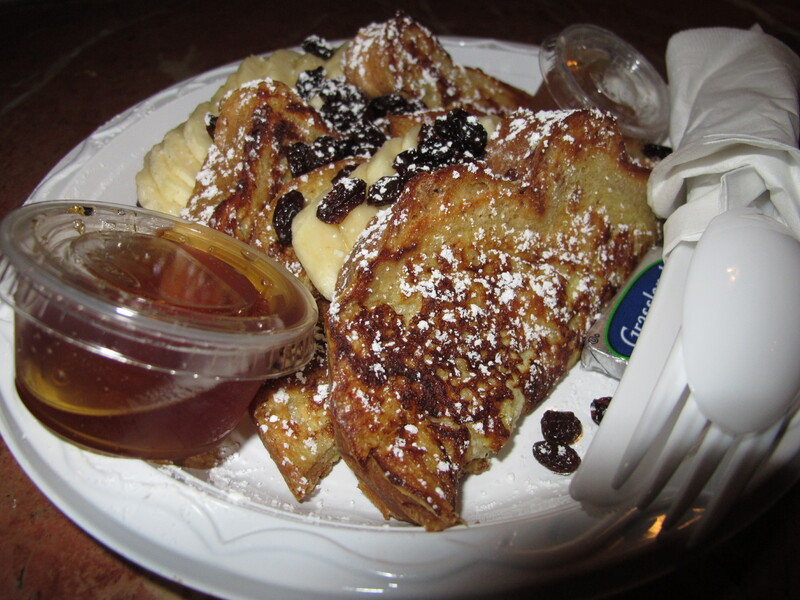 Her English muffins were the perfect receptacle for her house-made preserves and Hungry Teen gave the banana french toast an A+ rating. 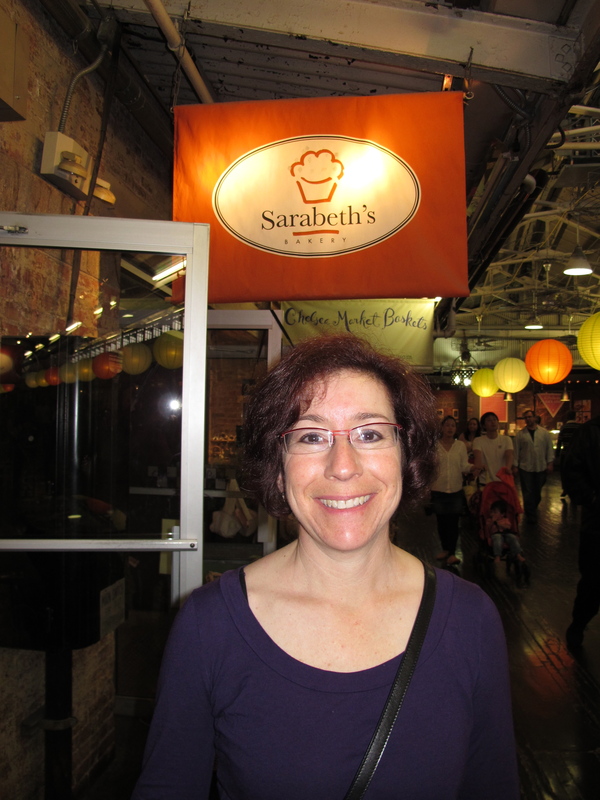 And yes finally – a picture of me (Beth) at Sarabeth’s. That evening, while the tired tween rested in the room, the Hungry Teen, DormantChef and I tried another restaurant near our hotel on 53rd called Obao. It appeared to be an Asian fusion noodle house which concerned me, to say the least. 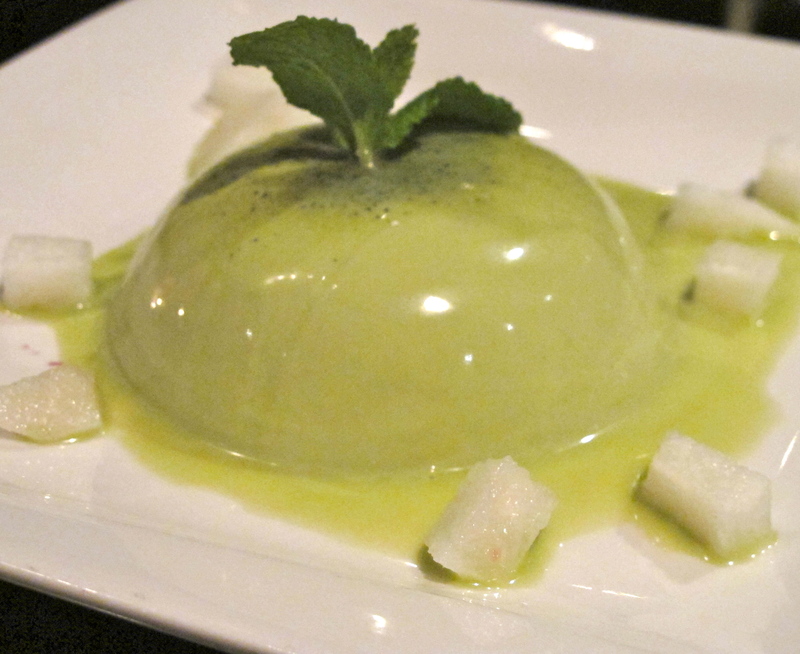 But my fears were unfounded, each dish we ordered was flavored appropriately for its ethnic identity (from Korean to Thai to Vietnamese) and this creative dessert was a show stopper – Green Tea Panna Cotta. A wonderful marriage of an Italian delight with Japanese color and flavor. And this is just another hole-in-the wall on 53rd. Hmmm…. 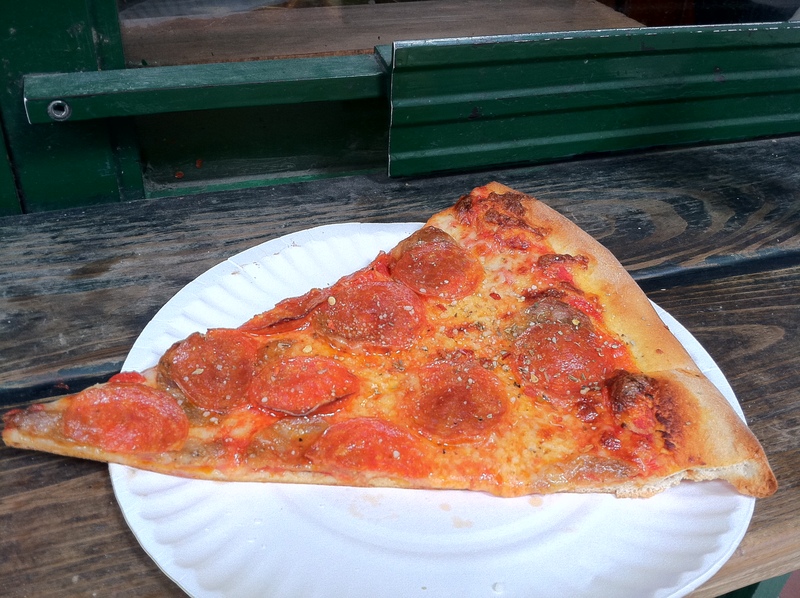 In search of pizza – despite my research into the best New York Pizza in Manhattan, we ended up eating in a hole-in-the-wall near Wall Street called Friendly Gourmet Pizza. I know what I like in a traditional thin-crust NY slice so we bought one piece and I tasted it. While the family watched in hungry anticipation, I bit into the crisp crust, bright robust-flavored tomato sauce and moderate amount of melted cheese topped with parmesan, oregano and red peppers. I gave it the nod and the eating frenzy began. As we consumed another 5 or 6 slices at the tiny corner shop, we all posted on Facebook and Twitter, eliciting angry and jealous responses from our West Coast pizza-deprived family and friends. This photo courtesy of DormantChef's iphone art - TechSavvyTeen was too busy eating. 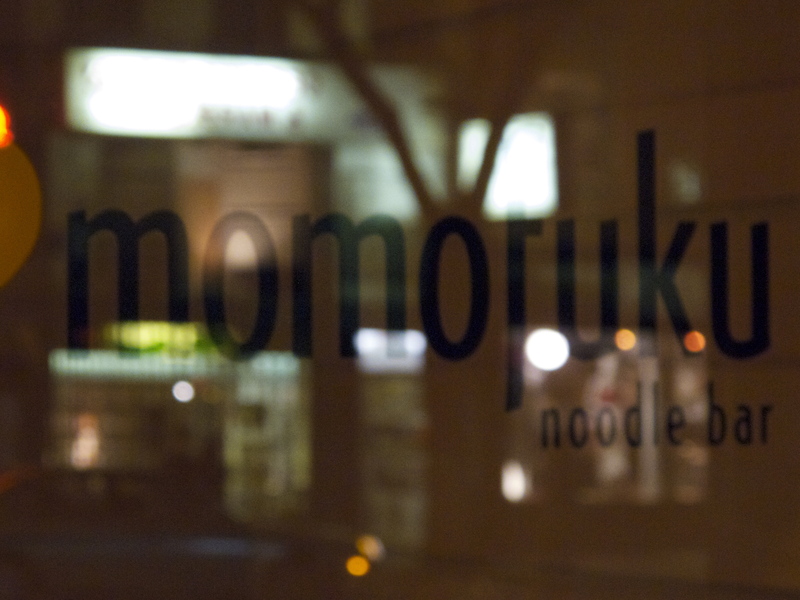 As if that wasn’t enough food excitement for one day, we managed to make it to the much-acclaimed Momofuku Noodle Bar for dinner, without even a wait for a table (but it was crowded). Could it really be as good as I’ve heard? 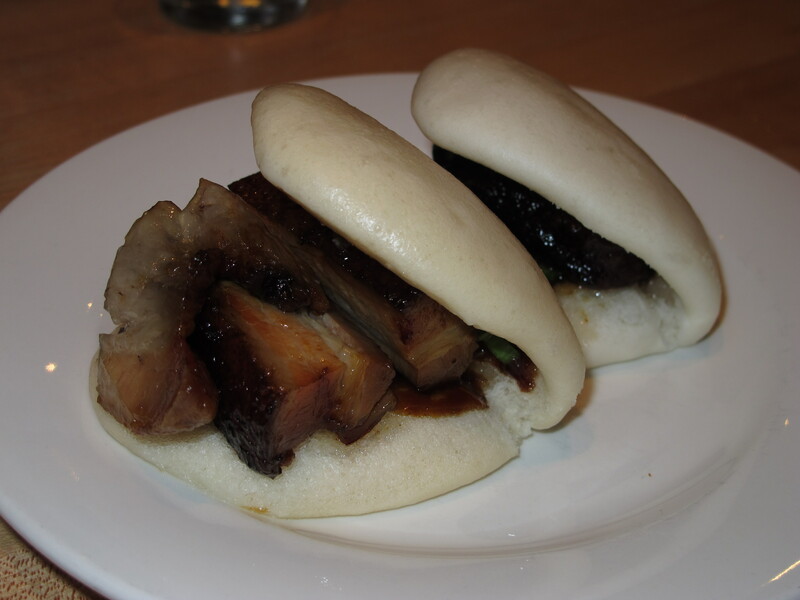 We tried the special halibut sashimi appetizer which really whet our appetites – moved on to the highly recommended pork buns which exceeded the waitress’ praise – bun was soft with a little bite to it and the pork was thick, juicy, sweet, and tender with a crispy barbecue crust. OMG! Yummy shouted all around the table. 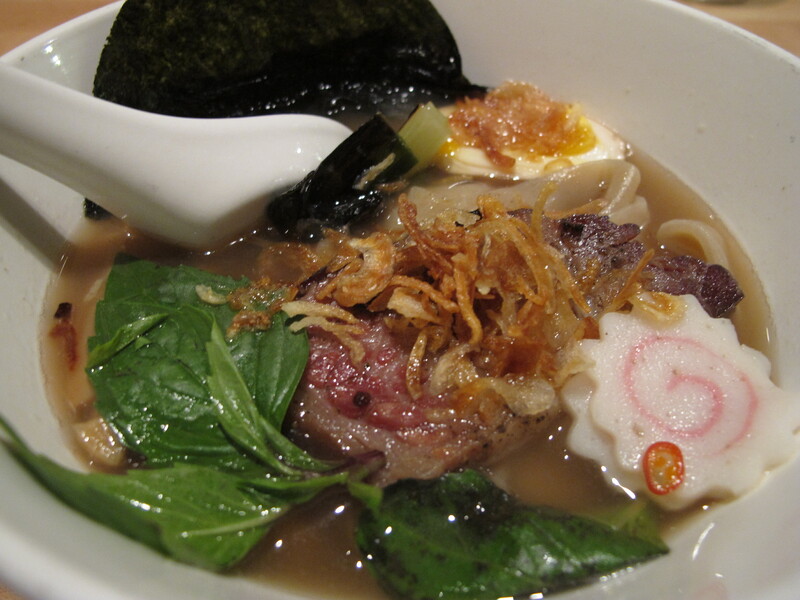 And the ramens were outstanding in every way – the broth was so complex without any unnecessary saltiness – the noodles were al dente and each ingredient from the various meats to garnish were just right in placement and taste. DormantChef thought it was better than the ramen he had in Japan. 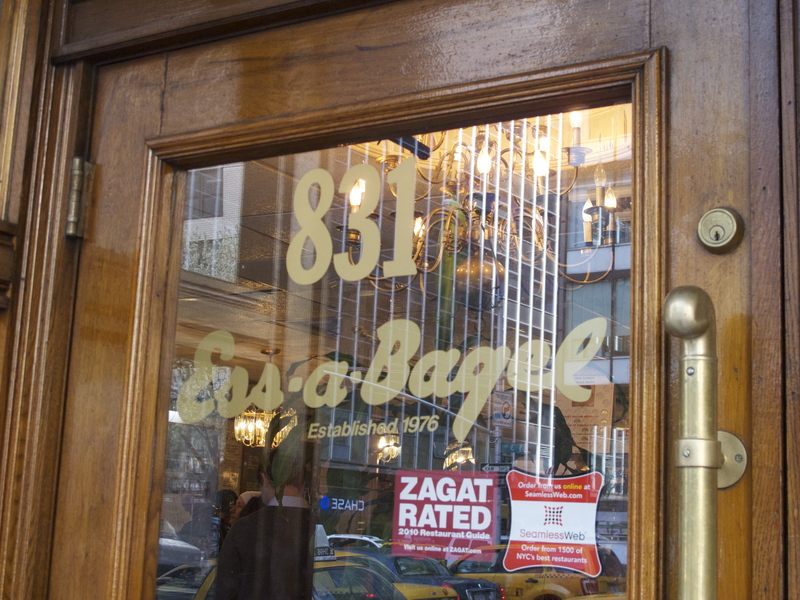 I received several recommendations for a gourmet food store on the Upper West Side called Zabar’s, so for our last breakfast we just had to go. Filled with gourmet food items ranging from an overwhelming cheese selection to a huge assortment of smoked fish to fresh baked pastries and bread to a block long kitchen supply section on the second floor, we were impressed and overwhelmed, wishing we had more room in our luggage to carry ice-filled bags home with the delicacies. The one thing we didn’t find in New York despite many tastes throughout the city? 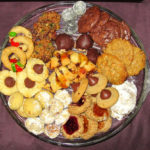 – a rugelach as good as the ones we bake each year for Hannukah. 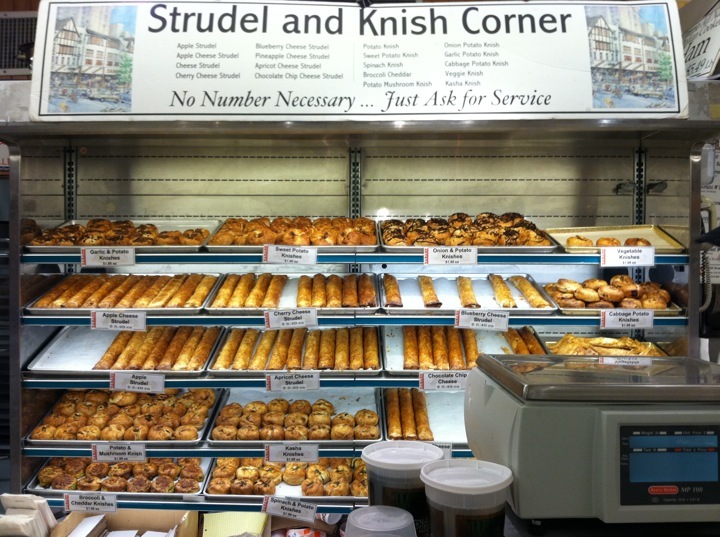 Maybe there is room for a new rugelach bakery in the Lower East Side…We’ll have lots of opportunity to explore that idea since Hungry Teen is hooked on New York City and is set on attending NYU for college. 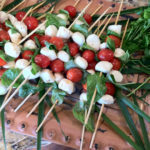 More Sunny Food for a Rainy Day – “linear caprese” photo featured in the LA Times Food section! Our success was in large part due to your suggestions and those of my friend who was there the week prior. 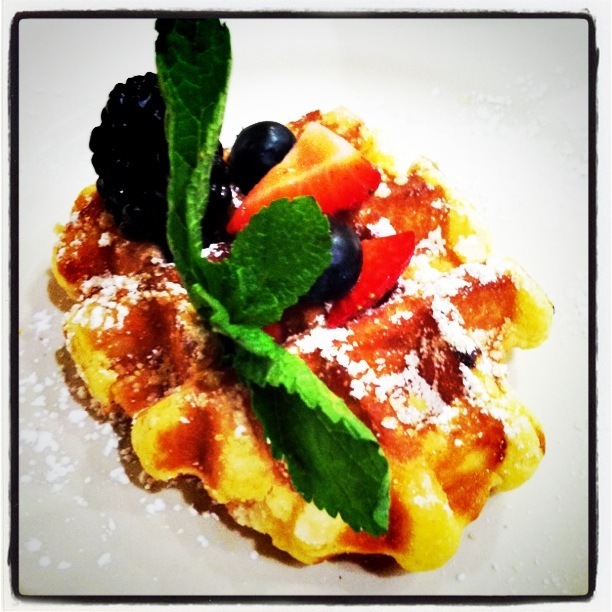 The city is so overflowing with fabulous food choices, that you really need some direction. 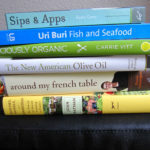 Of course, on the flip side, there is so much great stuff that one is bound to find great food even wandering aimlessly. 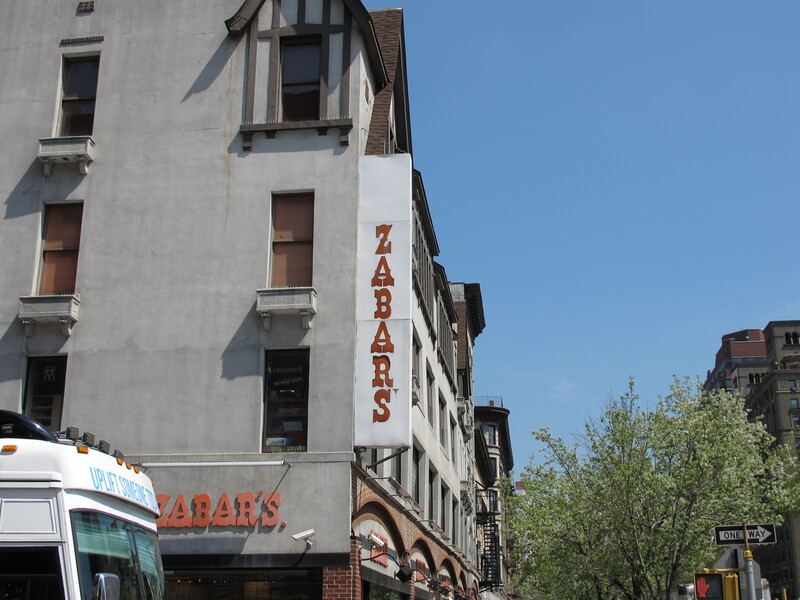 Actually, Zabar’s and Katz’s do FedEx …. Hmmm – Mother’s Day Gift? OMG let me just say that I’m so envious of your trip! This would be heaven for me. I remember visiting one deli in NYC many years ago, and that was the Carnegie Deli. The sandwiches were HUGE. Looks like the deli you visited has that same philosophy. Love your blog, by the way. Will be back! What a delicious Spring Break you had! 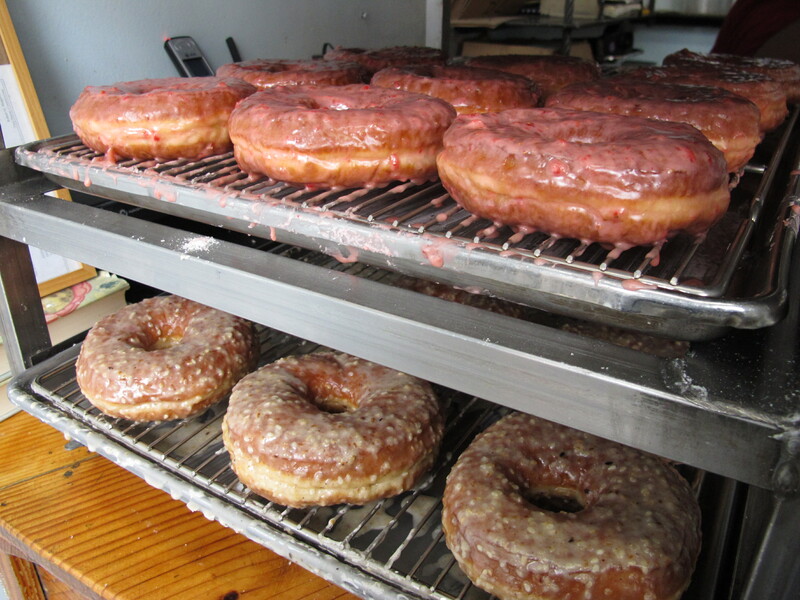 You already had me at the Doughnut Plant then came Katz, Eataly and Momofuku and so many more. So glad you had a wonderful time. I’d have to copy your itinerary the next time where in NYC! Lovely photos, too! Oh yes, put it on your must-do list. So much excitement in one place – food, history, culture, shopping, arts, people-watching OMG! looks like you did really well. thanks for the shout-out too. You’re welcome Justin. Thanks for the great recommendation. We really love your city! Wow you made me very hungry and wanting to go to NYC NOW! I’m Pam from our SITS group. Thanks for stopping by. If I made you hungry, then I did good! Great wrap-up of your NYC trip. I used to live in midtown on the east side and i always found little gems in the neighborhood. there were especially a lot of wonderful japanese restaurants with unassuming storefronts. now that your son is planning to be in nyc for school, there will be many more opportunities to eat your way through the rest of the city! 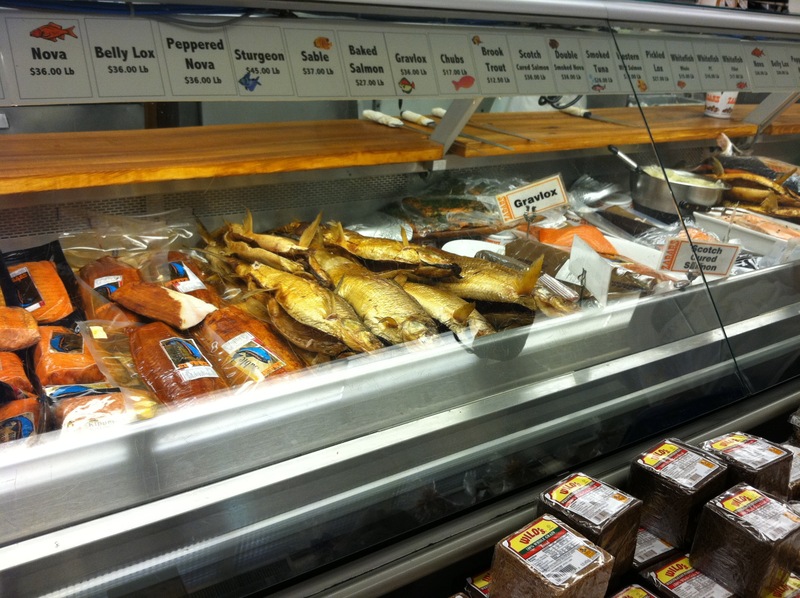 and brooklyn has a burgeoning food scene you need to check out also! There was a Japanese place on 53rd that also had live Jazz music – it was very tempting. I’ve heard a lot of good things about the Brooklyn food scene including a rec for an African restaurant that sounded wonderful. Just not enough time to get there on this trip. As for the kid – he’s got some work cut out for him to get into a good NYC school, but there is always hope. He really really loved it there. Beth-how do you stay so slim? The trip to NY sounded like heaven. 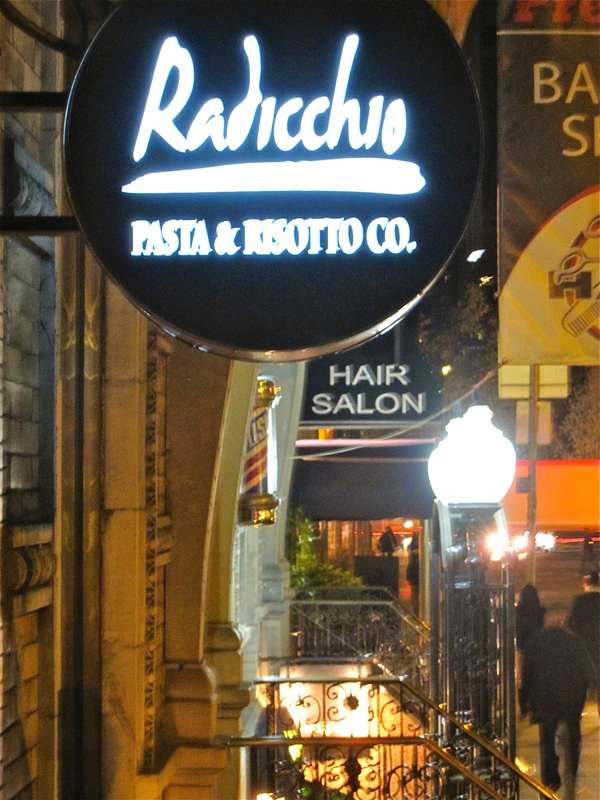 I will be taking Aaron and Darcy to Chicgo in June for my niece’s college graduation and need to research some great food. 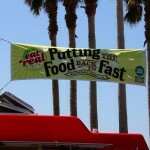 I grew up there and has visited a few times since I left, but the food world changes quickly. I promised Aaron the most amazing hot dog of his life, along with deep dish pizza and an italian beef sandwich. If you have any recommendations, let me know. 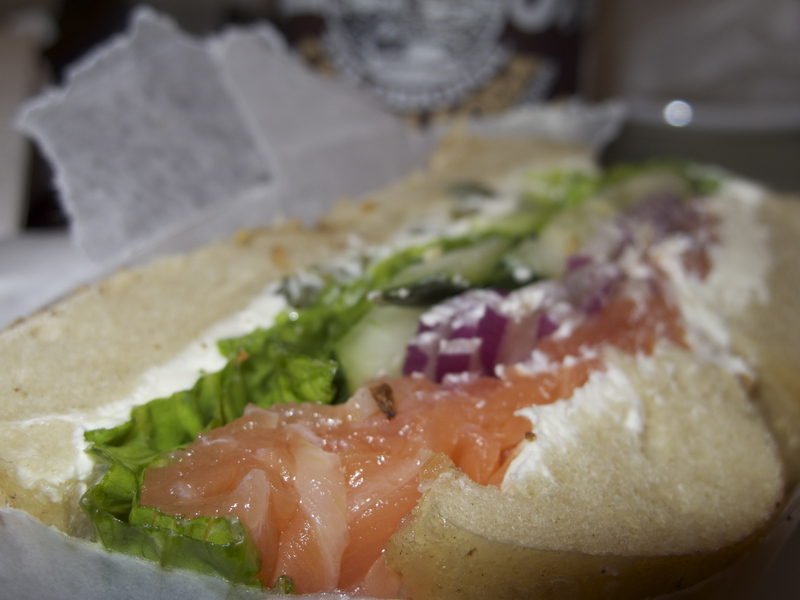 The photos from NY made me salivate-all that beautiful lox, smoked fish, and pastrami! Oy! Believe it or not, I’ve never been to Chicago! But I can ask around on Twitter for suggestions. As for the staying slim, as my good friend Joanna once told me, I exercise so I can eat. Plus it helps that we all love food so we can order almost anything and share it. If something is really great, I’m happy with a few bites. So much fun, you and I look for the same kinds of places. I will be going in a few weeks. Thanks for sharing! Should be great in a few weeks – hopefully more stable weather (is there such a thing on the East Coast?). 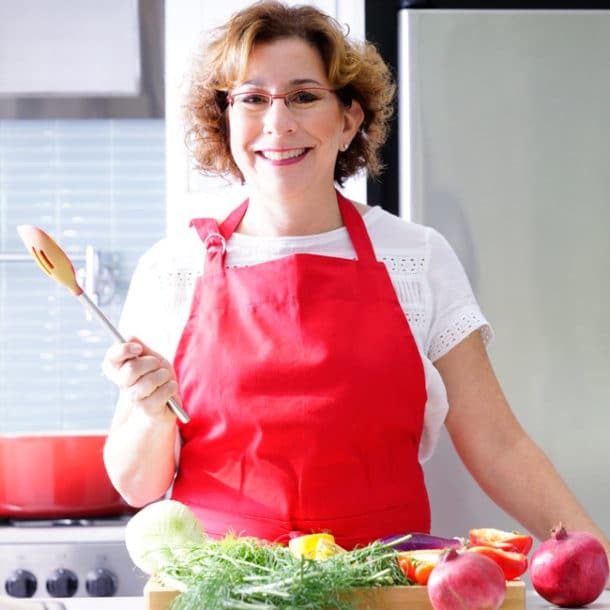 Can’t wait to hear about your food experiences while you are there. really tell it all. 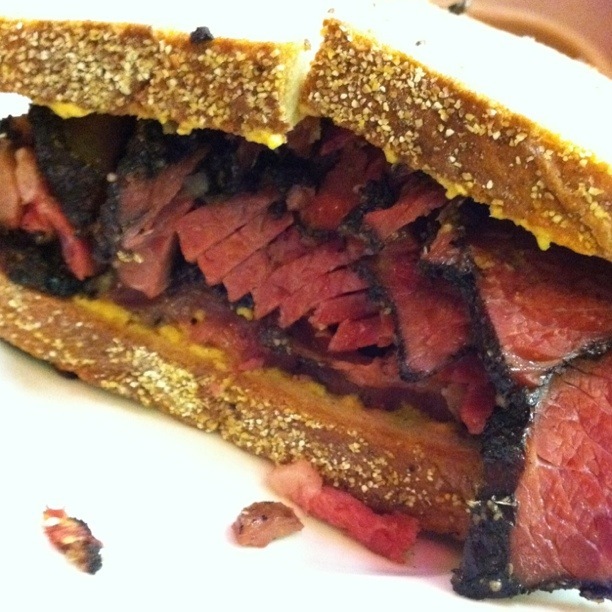 The one of the pastrami sandwich is driving me meshugah. Must go soon and try some of the other places you mention. Beth, very good descriptions of the excellent pictures taken by Gregory..
I’m glad the pictures are driving you “meshugah” – then we did good!